Worlds 2017 is underway, and home crowd Chinese team Royal Never Give Up handed Korea’s Samsung Galaxy its first loss of the group stage with a powerful one-two punch. The match between Samsung Galaxy and RNG was a one-sided affair for the latter. Galaxy was sitting on a massive gold deficit and hadn’t tallied up a single kill yet in the game. 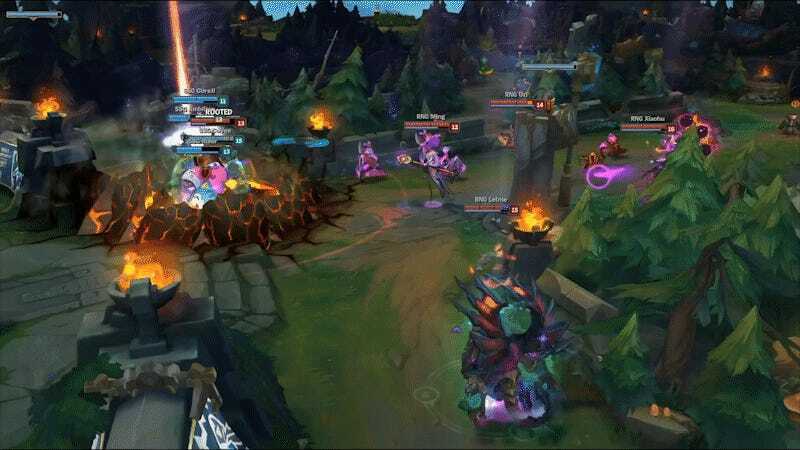 When Liu “Mlxg” Shi-Yu caught four members of Galaxy behind a tower with his ultimate on Jarvan IV, there was nowhere for the team to run to escape Yan “Letme” Jun-Ze’s Galio drop. It was the punctuation mark on a huge win for Royal Never Give Up, the cherry on top of a perfect game. After landing that massive combo, RNG would go on to take down the nexus and secure the win, still deathless. Royal Never Give Up now holds the top spot in Group C with a 2-0 record, while Galaxy drops to 1-1. Matches resume tonight, as the groups close out the first week of round-robin play in China and gear up for the second week.